Musakhan is a Palestinian cuisine dish, composed of roasted chicken baked with onions, sumac, allspice, saffron, and fried pine nuts served over taboon bread. This recipe adds a few other ingredients to make it amazing for Ramadan. Slowly sauté onions in 50 ml olive oil until translucent. Sprinkle with sugar and slowly continue to cook, we need only little light brown colour. Add vinegar and allow to evaporate. Keep aside. Marinate chicken in olive oil, black pepper, garlic and Knorr Chicken Shawarma Marinade. Grill on charcoal for smokey flavour, shred the chicken and keep aside. Layer the dough with diced tomato, mozzarella, chicken and then caramelized onions. Bake in the oven, once done layer with spinach and sprinkle with sumac and pine nuts. Combine the water, yeast and sugar in a small bowl. Set aside for 5 minutes or until foamy. Combine the flour and salt in a large bowl and make a well in the center. Add the yeast mixture and oil. Use a round-bladed knife in a cutting motion to mix until the mixture is combined. Use your hands to bring the dough together in the bowl. Brush a bowl lightly with oil. Turn the dough onto a lightly floured surface and knead for 10 minutes or until smooth and elastic. Place in the prepared bowl and turn to coat in oil. Cover with plastic wrap and set aside in a warm, draught-free place to rise for 30 minutes or until dough doubles in size. Dust work surface with flour. Knead dough and form into a long cylinder. Divide into thirds. 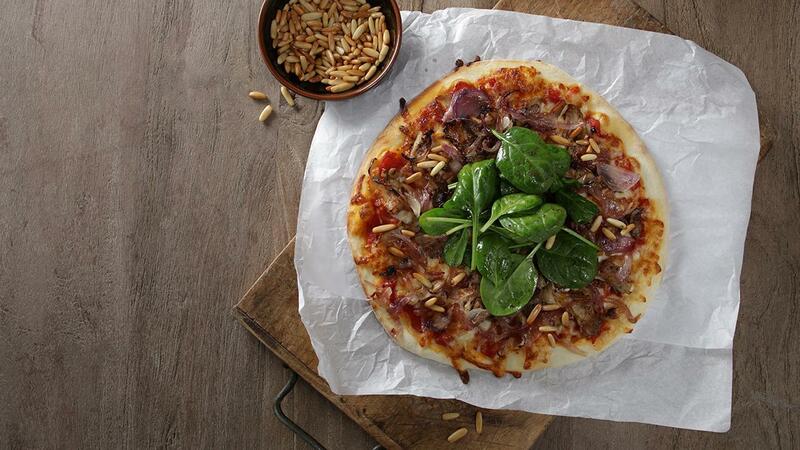 Use a rolling pin to roll each third into a 20cm disc, then add your toppings and bake.